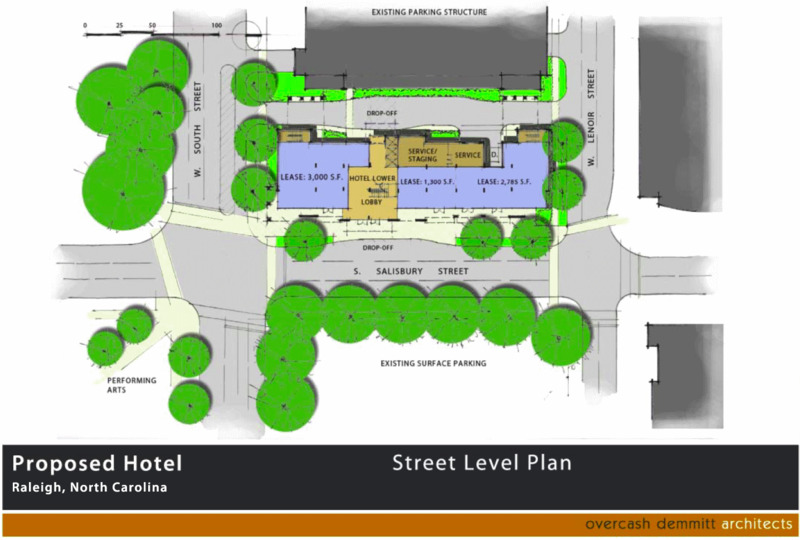 During Tuesday’s Budget and Economic Development Committee meeting, a deal was approved for the City of Raleigh and Summit Hospitality Group to move to the next step in bringing a new hotel to the convention center area. The current lot on Salisbury Street, just south of the convention center and facing the Performing Arts Deck, would be the future home of a Marriott Residence Inn. As part of the deal, the city-owned land would be sold for $1.73 million plus other requirements. 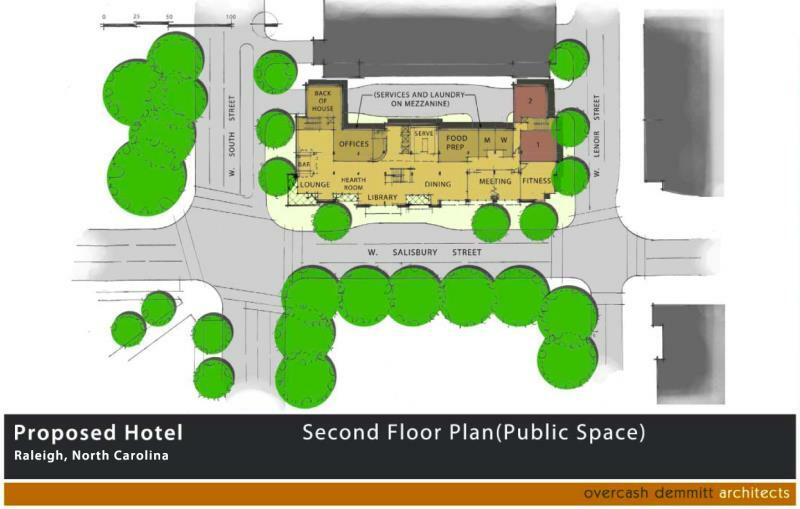 No new parking will be built to support this hotel as they plan to lease spaces out from the Performing Arts Deck. This means that the deck will get a more formal parking control system compared to its less structured operation today. Visitors will be able to enter and exit the hotel directly from it. The hotel is planned, at this point, to have approximately 140-154 rooms and ground floor space for retail and/or restaurant. If you look at the floorplans above, the bottom floor is predominantly comprised of that retail/restaurant space in addition to the lobby. The second floor, also shown above, are guest services, the lounge, etc. Happy to see this project move forward as we haven’t heard a thing about it in about a year. Super excited to see progress on this- 2014 is looking BIG. Already seeing the SkyHouse building foundation taking shape, should be seeing work starting on Charter Square Tower 1 (and then crossing my fingers we’ll hear something- ANYTHING- about Tower 2, and hoping it’ll be a big one), The L building should be starting soon, if I’m not mistaken, and of course the new Citrix HQ is almost done. Now we have this new hotel planned, and maybe we’ll see some ground being broken on this soon. And, oh, it’s JANUARY. 2014 is going to be Raleigh’s year. Also, great that it makes the “money shot” (in that second to last pic). The Charter Square tower 1 should peek just above the hotels, and I’m sure tower 2 will rise up in plain view of the money shot as well. The “L” Building is well under way, its moving quickly. Jake, Charter Square will be much more visible than you think according to a archtitect’s rendering with it in the skyline that I saw. The entire south face looks to be visible in the money shot along with some of the Western face. L Building is well underway. The support columns are approaching the height of the deck. Sadly, ugliness finds its way into our skyline. As if the convention Marriott Hotel wasn’t enough, now we get a second installment :( I am happy for those who are excited, but Site 4 deserves a MUCH better – and much bigger – project. This hotel may look good near the airport, but not in Downtown Raleigh. When this is done it will be too late to regret. Charter Square and Skyhouse are the only two ongoing projects (for our CBD) that I consider good, given the tough economic times and the current market conditions. The L Building should have been at least 1-2 floors taller, to stand above the deck. Don’t even get me started about the Citrix parking deck that towers above everything else in the vicinity. I still hope that the new hotel proposal doesn’t happen. Enough with pathetic looking projects… We deserve better. You are a far more experienced person in the ways of development than I will ever be, but the rendering with Charter Square seems to be a bit of an exaggeration in both height and width. Charter Square (South Tower) will be a few feet taller than Marriott Hotel, plus the rendering shows a building that takes up almost the entire lot, which is not the case as far as I know. Not to mention that the elevation doesn’t help the building to stand out as much when seen from this angle. I do agree that Charter Square will exceed expectations at the end, especially if the North Tower (as some of us tend to call it) stands tall enough to make an impact (i.e. taller than 400ft) The question I have for you is this: Can the foundation hold a building of that magnitude, or was it built for the original proposal? Glad to hear the L building has already made significant progress- I’ll have to go check it out. I totally get Ernest; it is a little strange that they made the Citrix parking deck so much taller than the actual HQ, but I hope that down the road there will be more development in the Warehouse District to even it out anyway. I also can understand why this new hotel might not be appealing, but I’m not sure I do agree that this lot can sustain a bigger building- it’s really not that large of a space, so the fact that they’re putting SOMETHING there is good enough for me. Plus- more hotels= more visitors! I think these buildings that “stick out like a sore thumb” will fit in better with the years ahead as more buildings rise up. Hey…. I’m just glad to see stuff happening! The hotel is incredibly ugly but it will serve it’s purpose. I just can’t wait for all of these buildings to be finished. Our downtown will feel MUCH more dense. What ^he^ said. My thoughts exactly. 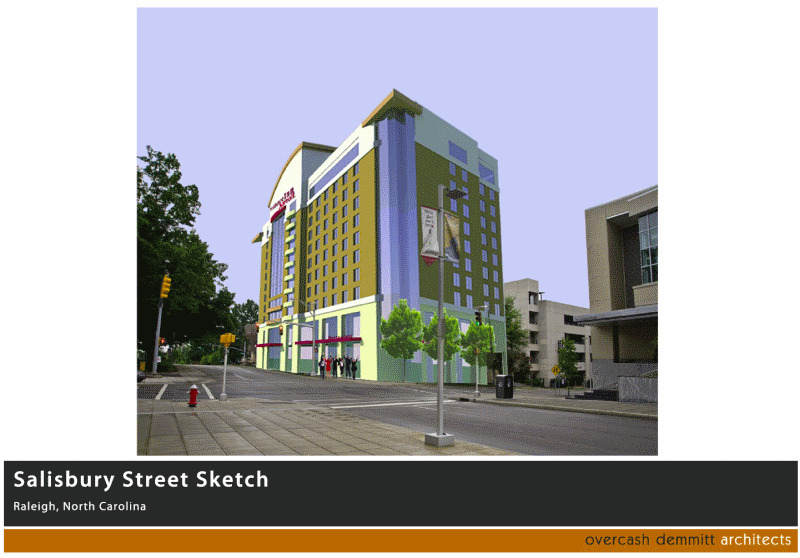 This is a decent project for an 11 story hotel. Serves it’s purpose. The glass and brick is an improvement on the Marriott on Fayetteville Street. The tower portion is a little funky but I think its much more important that there will be ground floor space for lease, with the hotel lobby on the second floor. Why does it have to be just a hotel? Why can’t developers join forces/share the cost and build a hotel, apts, and office space all in one building? That seems to be an easy way to add height. As well as save land for future developments. No no Ernest. Far from experienced, here. After revisting the rendering, I think you are correct. But as far as taking up the entire lot, the north tower’s footprint has always been smaller (taller, yes) than the south tower. I think think it may be less exaggerated there. But the south face looks too wide. I don’t think the south face should take up the entire block like that. As far as can the foundation hold more? This is something I have also wondered. I’d like to think that the load specs are a range instead of a firm height figure but just a guess. @Jake Anthony: The original proposal (Lafayette) was actually twice as tall. The site can certainly sustain a much larger building, but something around 20 floors would have been much better. I totally agree with Chad… The developers should work together more. My original idea was that this hotel could be a nice addition to Charter Square or The Edison, leaving Site 4 for future development. My biggest problem with this hotel is the design. Cheap looking, just like the Marriott Hotel across from there. NC SECU, Charter Square and Skyhouse are/will be nice additions and a deviation from the ultra boring designs we’ve seen thus far. Secondly, I found the size of this proposal “offensive” and I am afraid that it will set the tone for buildings between 10-15 floors in places that deserve more and better. Remember, there aren’t many lots where high-rise development can happen, unless we want to deal with NIMBYs. If we keep wasting prime real estate on small buildings we may never see some truly inspiring, iconic towers. It has to do a lot about the image that our city has been talking about for a long time. Our city’s image is simply underwhelming and doesn’t reflect Raleigh’s reputation as a diverse and growing economy. Sorry for the long post. I am excited to see things moving forward, but also very concerned about the direction. I hope that Charter Square will show the light for better developments in the future. Site 4 is nothing but a missed chance. In one of my past quick conversations with Craig Davis I brought up the question on the foundation and he said that it can hold more. BTW, I think you are correct about the width of the building, although I strongly believe that the overall size is exaggerated in the image they posted. Still, the building will have a positive impact on the skyline. Yep. As a whole it the rendering looks exaggerated. Ernest- well now I’m a bit disappointed too! I do remember seeing images of that building and wondered what happened to it (the Lafayette). But if you want to talk about a REAL waste of space… take a look at the proposals for the Edison apartments (which would be on the other side of the parking deck that SkyHouse and the Edison office building would be on). I also hope the Edison office building itself will end up being taller (the proposal for that is roughly the same height as SkyHouse, and it’s right across the street from PNC Tower. It’ll look like a dwarf if they keep the proposed plan). Jake – The recession took the Lafayette with it. And as far as the Edison office building, Triangle Biz Journal has an article from mid-Dec giving it 16 floors. This article ran after the discussion about adding parking levels to the tower. In the provided money shot, they have inverted the hotel face outward. This includes the glass side columns and protruding cornices which provide some visual breaks in the front of the hotel. However, in the blueprint schematics and subsequent renderings the columns and cornices are not present at the back of the building. Basically, it’s a “back of a hotel” and terribly unappealing. Where was the Appearance Commission on this one? The reason I wish it would be taller is to include more hotel rooms. Not for skyline purposes. 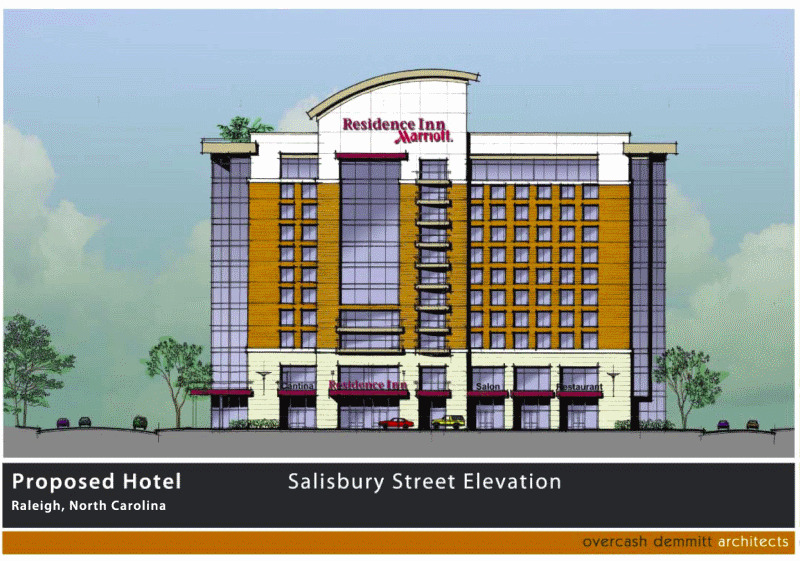 The article in N&O said that adding this hotel will only get the total number of rooms within walking distance to the convention center to 875. The goal is to get to 1200 rooms within walking distance to attract larger conventions. This build is just so blandly ugly. Where is the Appearance Commission indeed? When is the next meeting anywhere where I can go and rant about this thing in front of public officials? The location of this building deserves better architecture or at least something unique besides being ugly. @Jake Anthony: Don’t get me started with The Edison :( As much as I supported the original idea, I surely don’t want to see either of the two proposed components. Skyhouse was a scale-down I had no problem with, but neither the office, nor the apartment components is something I want to see. It doesn’t have to be the new tallest buildings, but PLEASE… Don’t waste such valuable land on such underwhelming buildings. @Greg: Empire Properties doesn’t have deep pockets, nor had they secured the financing part of the deal. It was, however, an excellent project that would fit into the area perfectly. As for The Edison office building, it will be 13 floors. The city approved that deal without need for additional parking. Short-sighted decision, IMO, but I surely hope something changes this project for the better. The article in the Bizjournals mentions a Hilton Garden Inn. Maybe that will close the hotel room gap?Haven’t heard much more on that. Does anyone else know more? All the projects seem to be a little short terms of wow. But everything did come to a screeching halt downtown it seems. Due to slowdown. Let cross our fingers and hope for better in the next round. Adrian, I wonder if Hilton Garden Inn is the one planned for the corner directly to the North from the L Building. Nothing spectacular – about 7-8 stories – but a small improvement over what’s there now. Anything would help. A lot more hotel rooms and retail space are needed downtown. On a positive note. When all the current projects are complete they should bring lots of people and business downtown. More people more demand. Hopefuly larger scale projects in the future. We can only hope????????? Why not combine the edison apartments with the office building? Make one mixed-use tower that’s as tall as the PNC tower, put it in the southeast corner perhaps, and save the rest of the block for something else? Vatnos, I had the same question, but I don’t expect any answer. I guess we allow developers to get away with cheaper solutions. I like Greg, but it is time for him to “kill” the nightmare he created for many of us, once and for all. he could place the office building he is proposing on the SE side of the block and leave the other half of the block untouched for now. The new hotel could be combined with the apartments. Maybe he can work some sort of land swap with the city, work with the hotel developer and build a 20-25 story building instead on Site 4. I am not saying it is easy, but it is doable. Does anyone know when the hotel will be finished or when they are planning to break ground? Also forgot to ask does anyone know when they are planning to break ground for the south tower of the charter square project. All I’ve heard is that they are closing the site. I’ll just say it. That hotel design is a piece of crap. Why don’t they build these Hotels higher than 10 or 12 floors.what is wrong with a 20 or 25 story Hotel. You’re going to need more Hotel space anyway. High risk, plain and simple. 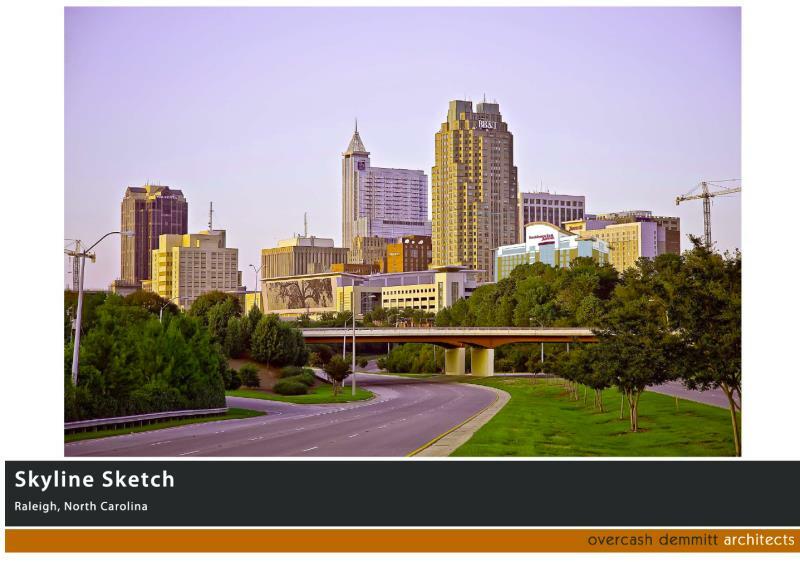 Not everyone believes in Downtown Raleigh’s potential, let alone wanting to be a pioneer. 10-15 floors is a safer bet. The thing that I do not understand is why developers are not willing to put aside their egos and work together. For example, this hotel could have been combined with The Edison Apartments, into a 25-30 story building in half the space.